I’m almost settled into my room at school, and I’m super excited for classes to start tomorrow. Thanks for being patient with me as I transition back into school mode. Your support and kind words have helped make this a very bright start to my senior year! I chose to do a spotlight on neutral cream eyeshadows because they’re a staple, and there are so many options. These are absolutely perfect as a base underneath powder shadows (especially during this hot weather) to keep the colors from blending together or creasing. They’re also great alone for when you want a long-lasting simple eye look to contrast a bright lip or bold liner. I’ll be focusing on the pot kind of cream shadows, but you can get some really awesome alternatives like jumbo pencils that do the same thing. Perhaps for a future Spotlight? Everyone, including me, raves about these cream shadows. They are the absolute best you can get at the drugstore. Barely Branded is a beige-champagne that goes perfectly underneath other neutrals like my Naked palette, and can add some shimmer and vividness to brighter colors. The color goes on light but is buildable; I usually like to put on a couple layers. This would be a great choice if you’re just starting out or want to experiment with layering different cream and powder eyeshadows. Look for a sale at your local drugstore, and you’ve got a deal you can’t refuse! I got this on a whim when TheBalm was on Hautelook a few months ago. It is a very shimmery gold-toned shadow that looks really nice alone as well as with other shadows. I don’t find myself reaching for it often because of its strong shimmer, but I haven’t been disappointed by it, either. This would be a great buy if you love shimmer or want a neutral that also pairs well with night looks. I wanted to include this here because the formula of these limited edition shades seem to be much different than the original Color Tattoo line. Precious Pearl is the whitest of these cream shadows, so it’s great if you want something that will make your other shades pop, but it does go on quite sheer. I like to layer the duochrome shades from this LE line, but Precious Pearl is best alone or underneath other shadows. That being said, this is not the easiest to use for that. The original line does have a pure white shade (“Too Cool”), but I’ve found that it’s much chunkier than the others, so I don’t use it much. There are probably better options out there for a white-neutral base (NYX jumbo pencil in Milk is awesome, but only if you want matte, stark white). 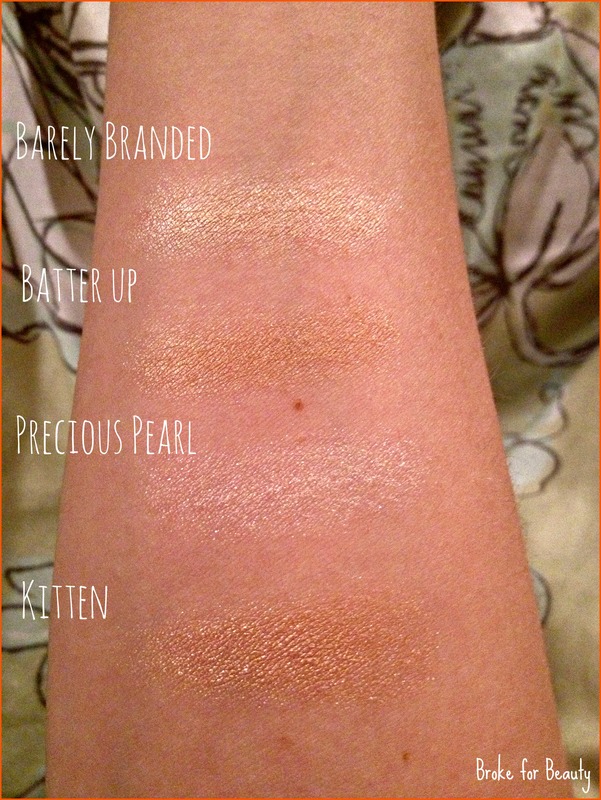 Kitten is a really wonderful shade, and I was so pleased to find it in a cream shadow form. I think the color would look better on people with cool tones, but I look better in warm tones and it’s still a flattering shade for me. This goes on a bit drier than the others, but it lasts a very, very long time. You can read my full review of this smudge pot here. If you’re looking for a high-end cream shadow, this is a great one, especially if you already love Kitten. I really want to try the MUFE Aqua Cream in shade 13 Warm Beige as another high-end option (and maybe as a possible dupe to Barely Branded??). I hope you ladies found this post helpful. Please let me know of some other great neutral cream shadows in the comments! Thanks for reading. Good luck going back to school! The Color Tattoos seem to be so hot right now, I forgot there were so many cream shadows out there. Thank you! Yeah, I’m totally loving the Color Tattoos. I’m having a hard time branching out to cream shadows from other brands that are more expensive!